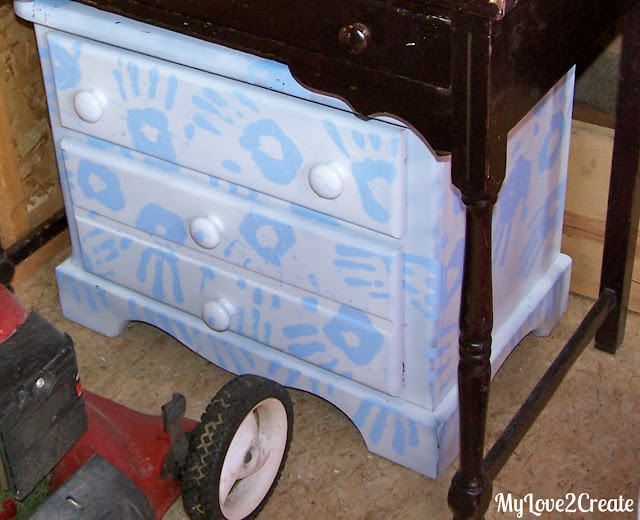 I FINALLY finished my boys dressers! It actually didn't take me too long once I got started, but then I thought they looked pretty plain with nothing on the top, so I have been having SO much fun doing projects just to put ON their dressers. I know I am crazy but I have had a blast doing it. 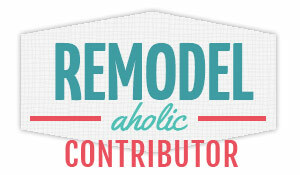 I will have tutorials for each small little project starting next week! This guy was picked up next to the dumpster one street over from mine, my son I knocked on the door to make sure it was ok to take it, but no answer. The neighbor said it was fine, the guy was throwing it all out (I say all because I got a few other things too, pathetic, I know). That was good enough for me! 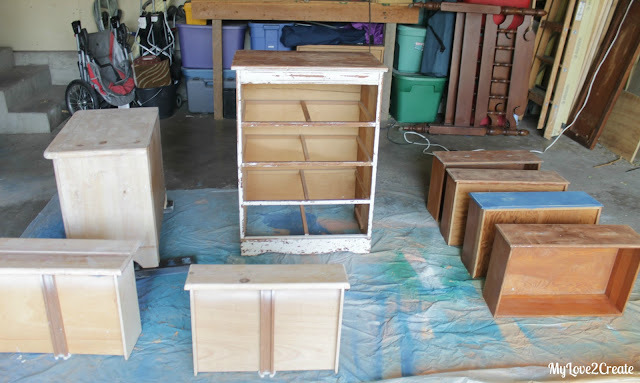 You can see the small nightstand in the back ground, I had started stripping it a while ago and this is as far as I got. 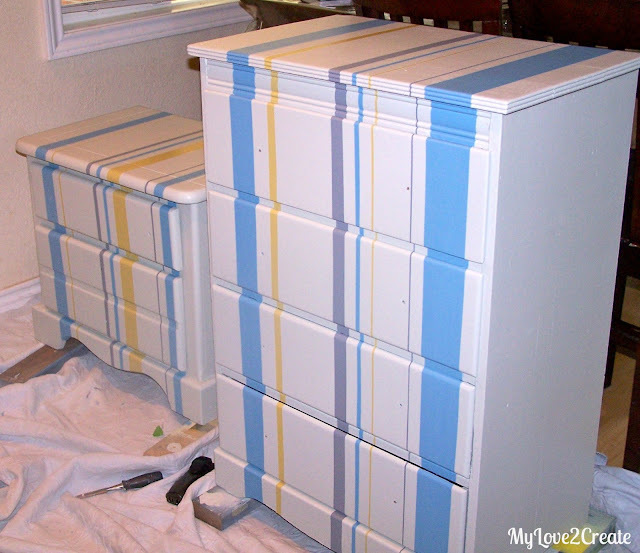 It had four different layers of paint....ugh! Once I got everything sanded and stripped they went to my garage to get painted. 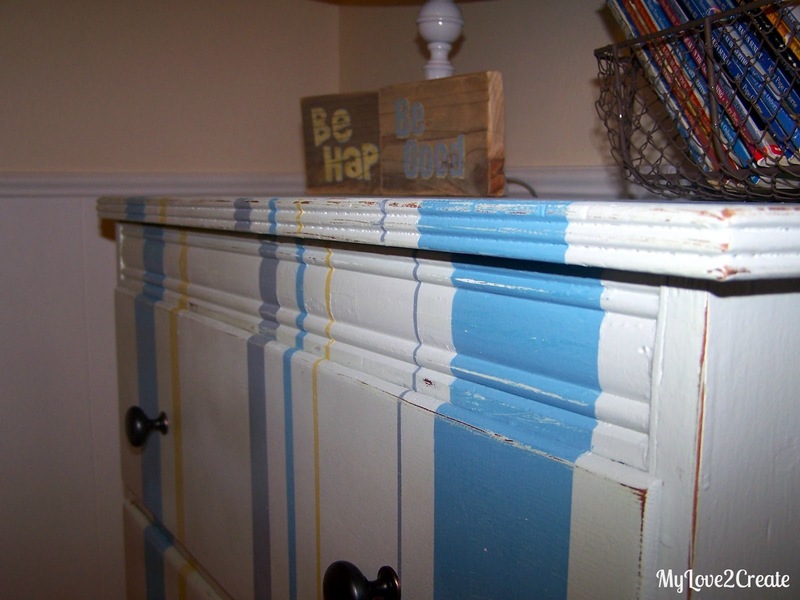 I used an oops paint, of course. I really like the color. And I forgot to get one with just the base color...oops! 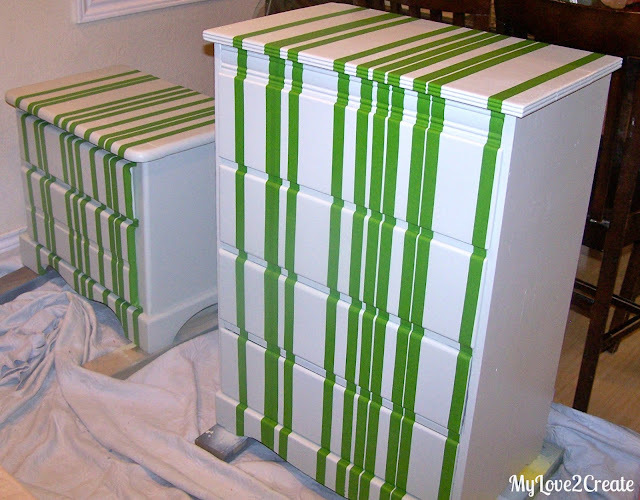 I had wanted to try stripes on these dressers, so I busted out the frog tape and went a little crazy! 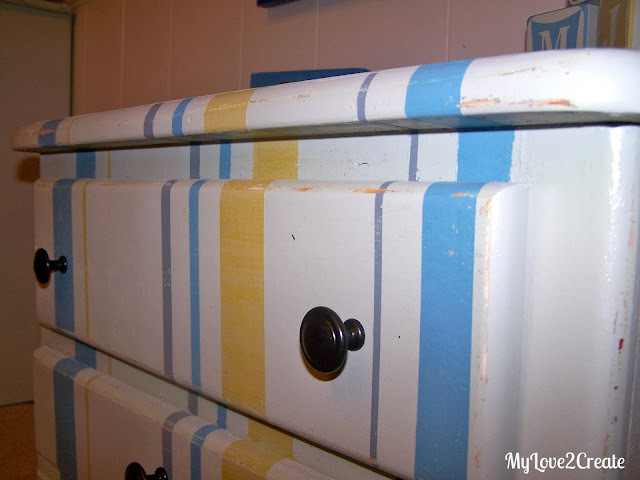 Then I found three colors I liked and started to paint, in a random pattern. 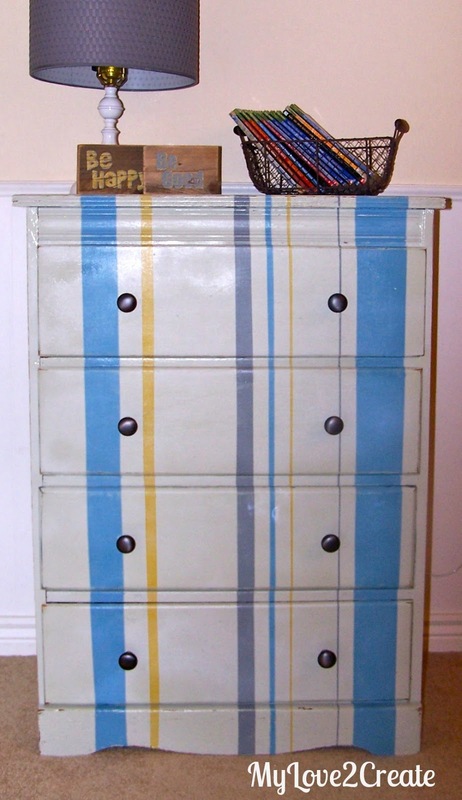 I decided to do the color pattern the same on both dressers, even if the stripes were different. Then I peeled off the tape, and did some touch ups. It was mainly in the spots where the drawers meet the dresser. I was hard to get the tape super sealed in these parts. This next step I debated for quite a while. Do I distress or not? I loved the clean sharp lines and thought I should leave it alone, but with little boys I knew that distressing was going to happen anyway...so I did it. 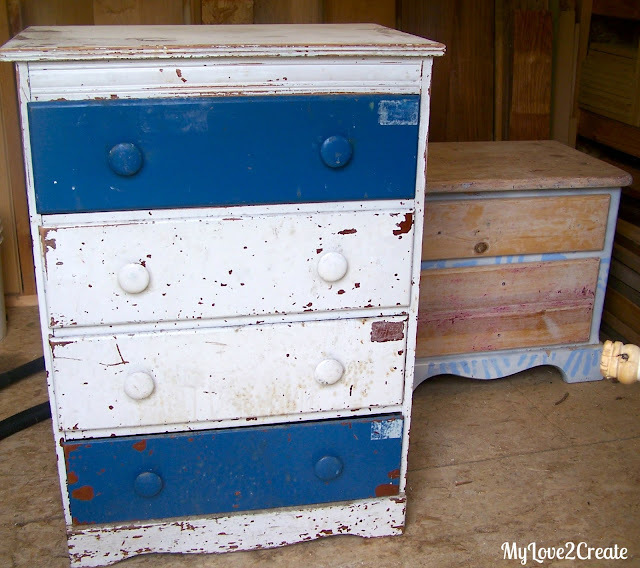 Since they are not matching dressers and not made from the same kind of wood they distressed very differently. Aren't they cute! 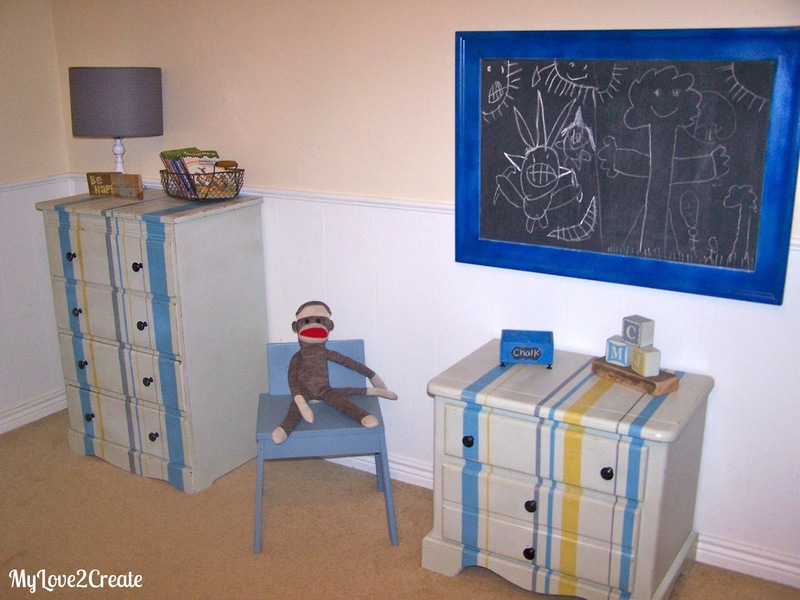 My boys love them and they have been loving all the projects I made for the tops of the dressers. Kids are so great, ANYTHING new is so exciting! If you follow my blog you might recognize those cute blocks, I posted about them HERE. I am so happy! 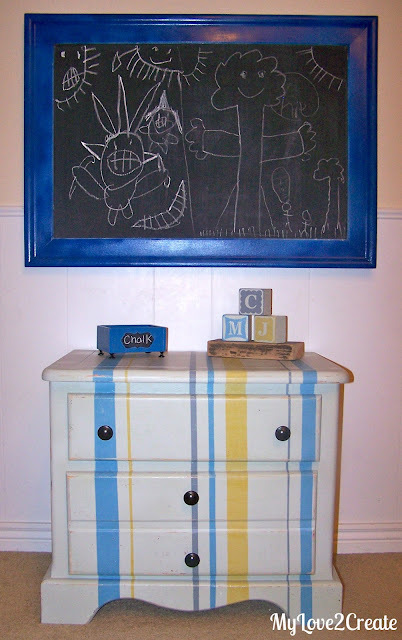 It is always fun to create something fun and happy! Have a great day, stay tuned for more great projects! I have been checking all morning to see if this post is up. I love love love the end result. 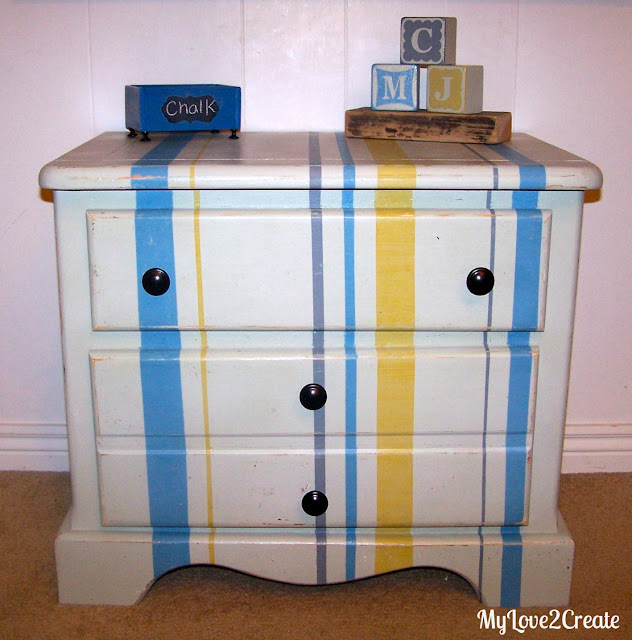 I love that you did on the whole front of the dresser and nightstand. The colors are soo nice. I like the distressing too. 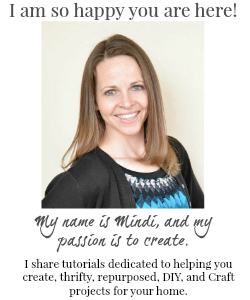 Oh Mindi...you are kind of awesome...did you know that? Hi Mindi: I love how these turned out. The colours are great and I think the distressing was a good idea. I found you through MRL linky party and an now your newest follower. Would love it if you would stop by for a visit when you have time and follow back. Have a great weekend! Mindi! 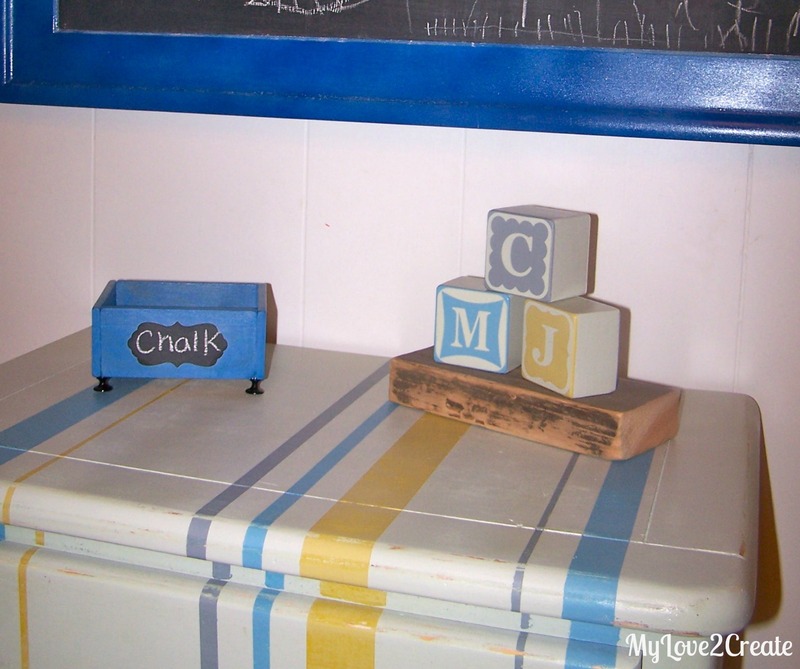 I love these pieces, and the decor you've adorned them with. 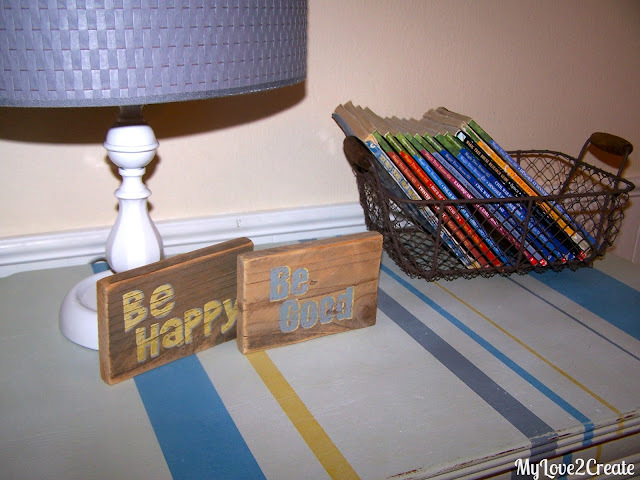 Love those little signs too! 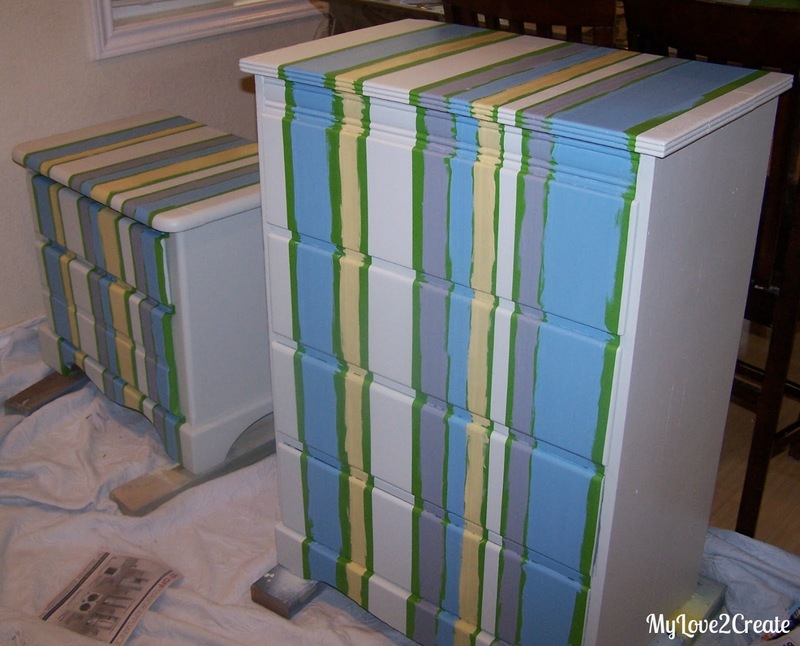 I love the stripes! It looks so cute. 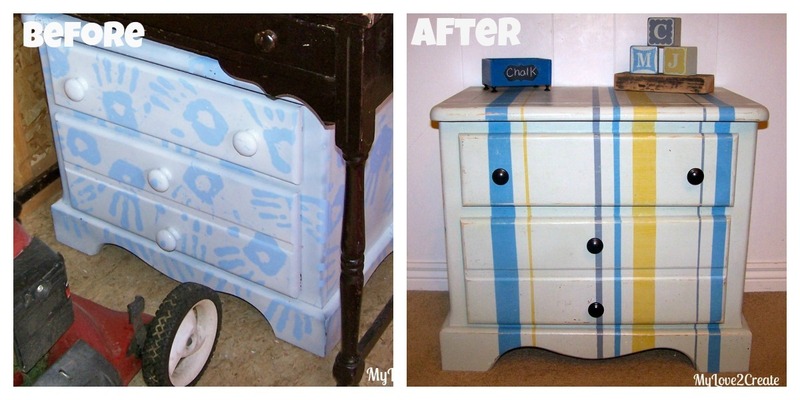 What a transformation! Great job on the dressers Mindi ... love the stripes but I don't think I could get that great result. Your boys should love them ... they are really nice. 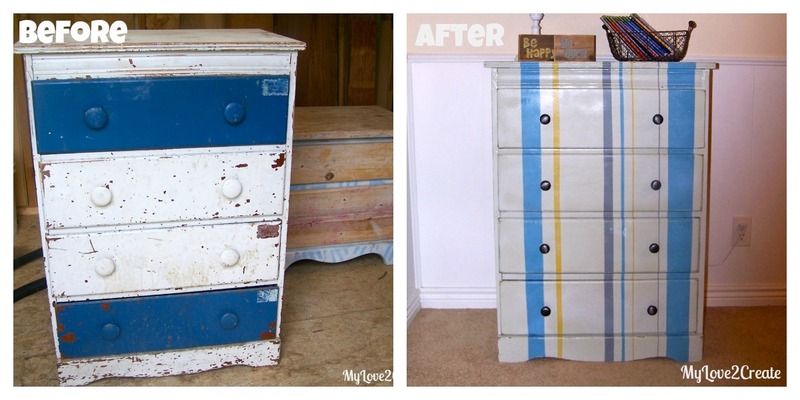 Thanks for stopping by Timeless Treasures and leaving a nice comment on my cabinet make-over.